(MENAFN - Daily News Egypt) Food shocks and their consequences across land and sea pose cumulative threats to global sustainability. These can be the main challenges facing the United Nations Sustainable Development Goals (SDGs) as they could disrupt food supply and security, livelihoods, and human well-being. A new research published by Nature Sustainability on Monday has identified 226 food shocks across 134 nations in a period of 53 years. Findings of the study, which was conducted by a team of researchers from Australian and American universities, referred to an increasing frequency of food shocks across all sectors on a global scale. The study's lead author Richard Cottrell from the University of Tasmania in Australia told Daily News Egypt that the study focuses on food production shocks which are sudden losses of crops, livestock, or fish due to extreme weather conditions and geopolitical events like war. 'We wanted to know if there was a difference in the frequency and causes of shocks to land-based food production in crops and livestock, versus aquatic food systems, such as wild caught and farmed fish, and also whether there were any links between both of them," he said. The researchers analysed 53 years (1961-2013) of crop, livestock, fisheries, and aquaculture data to identify where and when the shocks had occurred. Once identified and knowing which commodity was affected (e.g. wheat), they dug into the literature, scouring scientific publications, or news and NGO reports to find what had happened to that commodity in that country at that time. The study found that extreme weather conditions and geopolitical crises were the dominant drivers of food shocks, but the effects of these causes varied across sectors. 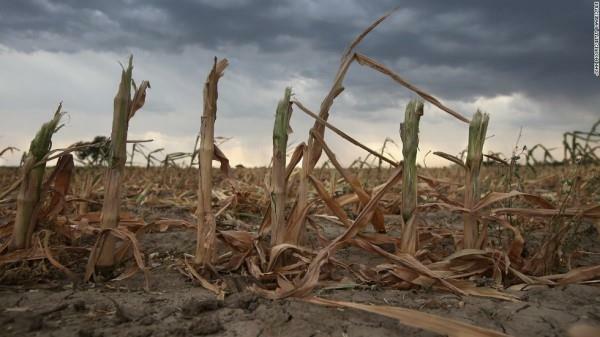 Most of the shocks that affected crop production were caused by extreme weather conditions, reinforcing concerns about the vulnerability of arable systems to climatic and meteorological volatility across the globe. Extreme weather was found to be a major driver of shocks to livestock by 23%, particularly where reductions to feed occurred. For instance, severe summertime droughts in Mongolia in 2001 and 2010 reduced fodder and feed availability, fluctuated livestock condition and led to mass deaths during extremes winter weather. Diseases of foot and mouth also contributed to 10% of livestock shocks. However, geopolitical crises, such as economic decentralisation in Europe or conflict in sub-Saharan Africa, accounted for the greatest proportion of 41% of the livestock shocks according to the analysis. "We found for agriculture (both crops and livestock), that extreme weather (e.g. floods, droughts, storms) and geopolitical events (e.g. conflict or state dissolution) were the most dominant drivers of shocks. For aquatic production, overfishing of wild-caught species and diseases in farmed species were the leading drivers,' Cottrell said. "We found that shocks to food production have increased through time across all food sectors," the lead author added. Cottrell noted that his team found also in many situations, that shocks on land and sea were often connected via joint threats or antagonistic effects. For example, in Ecuador, a flooding associated with the 1998 El-Nino caused widespread damage to agriculture – but between 1998 and 2000, the country's shrimp farming industry also suffered huge losses because of an outbreak in white-spot disease. While seemingly unrelated, both the inclement weather on land and the onset of white-spot syndrome are associated with abnormally warm waters, common during El-Nino events in the east Pacific. In contrast, when Dominica's banana crop was decimated by Hurricane David in 1979, marine fish catch rocketed for a few years as people looked for alternative sources of income. The researchers detected a shock only a few years later in fisheries' data, when overfishing was reported in nearshore waters. Synchronised threats to food production across multiple sectors can pose a real threat for food security. Millions of people around the world rely on agriculture and fisheries simultaneously as an adaptation strategy to deal with seasonal fluctuations in resources. The double jeopardy of linked threats can make this impossible. Meanwhile, unanticipated shifts in people's resource use (particularly across the land-sea divide) during times of crisis, such as in Dominica, provide other sustainability challenges when it comes to managing and protecting natural ecosystems. Understanding these links will become increasingly important as we strive to meet global sustainability targets but the climate in which we produce food becomes more volatile. Identifying direct and indirect links between land and sea will help prevent negative outcomes for natural ecosystems and biodiversity which can happen when people switch resource use for food or livelihoods. But understanding the major threats to production across each sector, will be key to maintaining stable and safe food production into the future as our population grows. "We also need to build resilience in our food production systems as shocks become more frequent. With greater frequency, people have less time to recover and acquire assets that help them cope during times of hardship," the researcher said.